The controversial execution of death-row inmate Troy Davis on Sept. 19 sparked nation-wide protests as opponents of the death penalty took up their pens and took to the streets. Armed with signs, candles and a megaphone, local activists rallied on the Amherst Town Common at 5:30 p.m. last Wednesday. Among the 80 attendees were Five College professors, Amherst residents, as well as over a dozen students of the College. 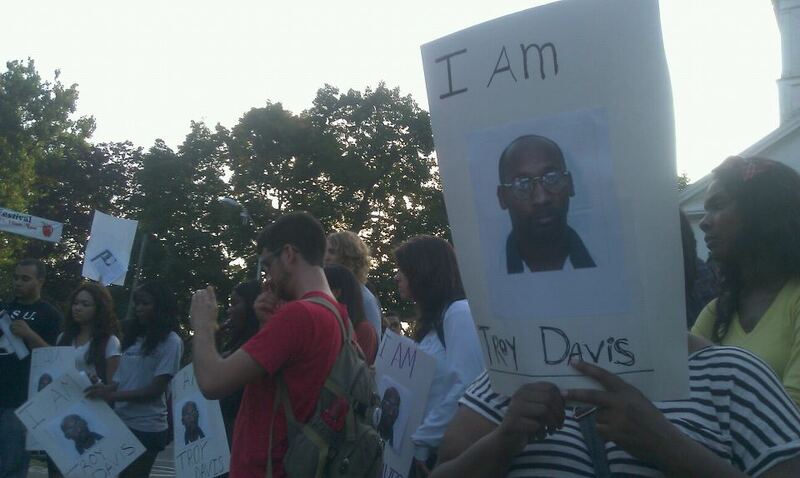 The emphasis on racism has been a defining feature of the protracted fight surrounding the Troy Davis case. Convicted for the 1989 murder of off-duty police officer Mark McPhail in Savannah, Ga., a state county court sentenced Davis to death in 1991. However his execution was stayed three times between 2004 and 2011 as Davis’ lawyers claimed that key witnesses in the original trial had since recanted their testimonies. Amnesty International took up Davis as the face of their campaign against the death penalty as a racist institution. According a 1990 report by the U.S. General Accounting Office, there is “a pattern of evidence indicating racial disparities in the charging, sentencing and imposition of the death penalty.” The organization reports that since 1977, a disproportionate number of death row defendants have faced execution for killing white victims, though about half of all homicide victims in the same time period were African-American. Throughout the 12-year struggle to disprove his guilt, Davis continually maintained his innocence. On Sept. 20, the Georgia Board of Pardons and Paroles denied Davis’ last appeal for clemency. Davis was set to be die by lethal injection at 7:00 p.m. on Sept. 19. At 6:59 p.m., one Amherst rally-goer proposed a minute of silence for Davis, but was shouted down. Hope returned anew as the Supreme Court of the United States (SCOTUS) delayed Davis’ death to deliberate on a last-minute stay of execution request. Protestors around the country cheered the news. Many groups began to dissipate, believing the execution had been put off until a later date. Demonstrators on the Amherst Town Common dispersed at 8:30 p.m.
At 10:20 p.m., the SCOTUS released a one-line order stating that Davis’ request had been denied. The execution proceeded. At 11:08 p.m., Davis was pronounced dead. Anna Quan ’13 and Fayise Abrahim ’14, both present at the Wednesday rally, described the confusion caused by the Supreme Court decision. “I was told that there was a seven-day waiting period,” said Abrahim. “I think that they wanted to divide people so we couldn’t organize,” said Quan of the SCOTUS’ four-hour delay. “At 10:30 they made the decision not to stay the execution, but by that time everyone had gone home. Before the rally ended, we were planning to continue the protests for seven days.” Once the decision came down, however, activists were unsure of how to continue and mobilize. “It was trying to dissemble people,” said Quan. The head of the College’s Amnesty chapter Kinjal Patel ’13 was less certain of the SCOTUS’ motivation, but agreed that the general sentiment was that of suspicion. In the place of week-long protests, local activists and students held vigils for the Thursday and Friday immediately following Davis’ execution. A second rally occurred on Saturday, Sept. 24, to protest mass incarceration and to call for the abolition of the death penalty in the United States. Only a handful of students from the College attended these events. As a student activist leader on campus, Patel is intimately acquainted with the singular difficulty of rousing troops at the College. In 2009, Patel and Amnesty invited Davis’ sister, Kimberly Davis, to speak at the College. Ten people attended the event. “I feel like a lot of people are very apathetic,” Patel said. All may not be lost, however, as Davis’ execution has sparked an unlooked-for response from students. Since last Wednesday, Patel has received numerous emails from students interested in Amnesty and issues of human rights. While the death penalty has not been a major focus of the College’s Amnesty chapter in the past, Patel plans to make the issue a focus for the group this coming year.